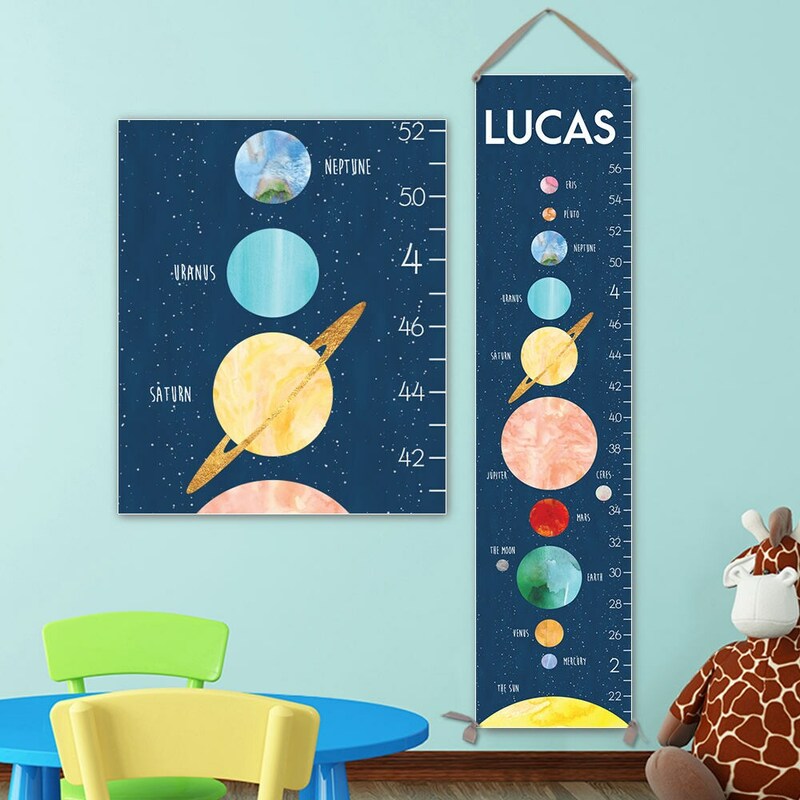 A solar system personalized canvas growth chart for your Outer Space Nursery! A favorite by kids and parents alike. Record your child's height on the chart with a permanent marker. The growth chart arrives ready to hang with canvas wrapped wooden dowels at top and bottom for flat hanging and an attached silky grosgrain ribbon for hanging. Our canvas growth charts are printed with a professional large format printer with archival quality giclee inks on heavyweight, museum grade canvas. The colors are stunning and the canvas texture is luxurious. Kids love seeing their name in big letters up in the sky and parents love the modern and stylish design. • When you order, please leave your child's name in the Notes box at checkout. RECORD YOUR CHILD'S HEIGHT ON THE GROWTH CHART! Use a Silver Metallic Sharpie marker or other opaque paint marker to record your child's height on the chart. You can order one here. (Free shipping if ordered with a growth chart): https://www.etsy.com/listing/248088321. • Ships within 1-3 business days. 3 Day Shipping available.